With thousands – 47,000 and counting – of options out there, it’s hard to choose the right plugin for your WordPress Website. In this post I am going to discuss my current (2018) favourite plugins to use on both mine and my clients website. Plugins are always changing, updating, improving and sometimes just disappearing. Not every plugin will be good for you and your website, but it’s a good start. On this list you will find a mixture of both free and premium plugins to take advantage. Happy WordPressing! Akismet is yet another plugin developed by the people behind WordPress (Matt and his team at Automattic). It is one of the default plugins of WordPress that comes with every new WordPress core installation. It is basically an anti-spam plugin which checks all comments and filters out the spammy comments. No doubt, search engines are the major source of traffic for every website. The number of internet users using search engines is reported to increase steadily, making the importance of Search Engine Optimization more relevant than ever. 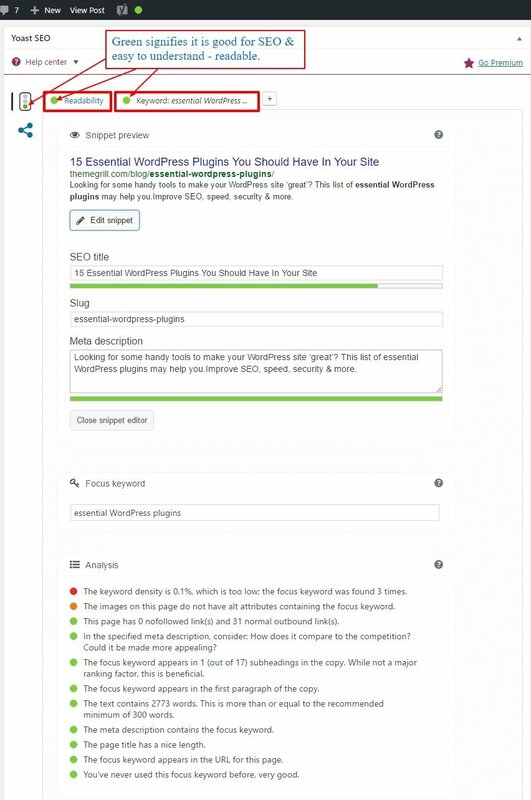 Fortunately, there is a great plugin like Yoast SEO for WordPress users. Yoast SEO is an awesome plugin which guides you all the way to create better content and improve your ranking on search results. It focuses on creating the content which is useful to the users as well as technically SEO friendly. The goal is to help the users, gain trust and sustain the rankings which they call sustainable SEO. Firstly, it makes you choose a focus keyword and use the keyword appropriately in the article you are writing. Page analysis feature checks if you have used the focus keyword everywhere on the image alt tags, meta description, headings and the whole post. Furthermore, it suggests you to properly set up the text and images for better usability and visibility for search engines. In addition, it helps you improve the way your page/ post looks on the search results with snippet preview. Creating better headlines and catchy Meta description can greatly increase the click-through rates for your site. It has added Readability feature which helps you to create a simple and understandable content. Google XML Sitemaps is another very useful SEO plugin for WordPress. The plugin helps the search engines like like Google, Bing, Yahoo etc. to better index your site with a special XML sitemap. As you activate the plugin, it will automatically create an XML sitemap for your site making it easy to index. A sitemap enables the search engine bots view the complete structure of your website and retrieve the results more efficiently. WordPress caching is one of the best ways to improve website performance. The general idea of caching is storing the website data temporarily in the cache so that it loads faster the next time the user opens the same page. Cache is a place to store something temporarily in the computing environment. To enable caching in WordPress, you can use WordPress caching plugins. Caching plugins will cache your posts and pages as static HTML files which are served to the users. This reduces page loading time drastically and helps to optimize overall site performance. Additionally, enhanced site-speed will profoundly impact your site SEO. W3 Total Cache WordPress plugin is one of the most popular plugins and probably the best caching plugin for WordPress. It features page cache, database caching, object caching, browser caching and a lot more. Besides, it lets you integrate CDN services to reduce page load time. Besides, it has options to minify and HTTP compression of the HTML, JS, and CSS files so that you can save bandwidth up to 80%. With the reduced loading time, you will get better ranking on search results which consecutively result into high traffic and more conversions. Images are the great assets for your post/ page which easily grab the users’ attention. Uploading images helps you deliver the message many times better that simply the texts can. They make your page look attractive, catchy and engaging. While being so helpful to make you site more appealing to users, images also take up a lot of storage space and slow down your website. You can’t simply afford to ignore the slow site speed and look for the disaster to happen. Wait a while, here’s good news – you can compress images! Yes, you can compress and optimize the images without reducing the quality of the images using WP Smush plugin. It optimizes all of your image files in JPEG, GIF and PNG formats using advanced compression techniques and saves lots of storage space. It auto-smushes all your attachments on upload while you can also smush your attachments manually in the media library. Google analytics is a great free to use statistical tool for understanding website traffic. Understanding your audience and catering to them is a great way to improve your user traffic. 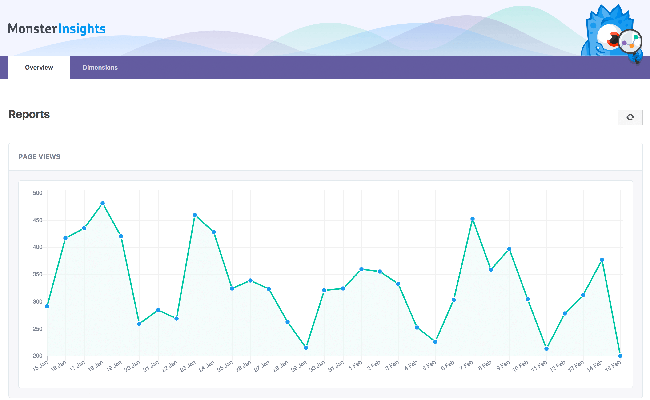 Therefore, it’s an obvious choice to use a Google analytics plugin for your WordPress website and MonsterInsights’ Google analytics tool is one of the best plugins out there for this purpose. 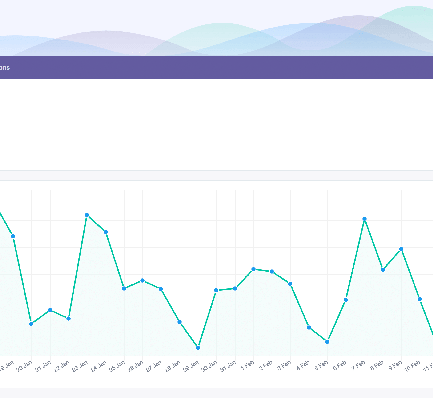 The plugin allows you to monitor various real time stats regarding your website. Furthermore, using Universal tracking, you can track user views from multiple platforms and devices as well as receive various demographic and interest reports. As a website owner, one of the most crucial things to do is to keep your site secure from the hackers. It is something that you cannot afford to ignore. There may be thousands of malicious bots on the web which can attack your website anytime and destroy your entire work in no time. That is why you must always prevent the spams and keep your website secure. With the monitoring your real-time traffic, you can be aware of the security threats your site is facing and take an instant action against it. MailChimp is one of the most popular email marketing services to manage subscribers, send emails and track results in the bulk. It is no doubt a great marketing tool for the webmasters and business owners. To integrate MailChimp for a WordPress site is really easy with the plugin MailChimp for WordPress. It is a free plugin which allows you to add beautiful subscription forms in your WP blog. If you want to use the plugin for commercial purpose, you can try the premium version. The plugin lets you create beautiful opt-in forms to add more subscribers to your email list. Besides, you can easily integrate the plugin with any other form on your site like contact form, comment or checkout form. It supports all the major form plugins like Contact Form 7, WooCommerce etc. Ninja Forms can be downloaded from WordPress.org free of charge. With an intuitive drag and drop interface and a collection of over twelve form fields, it should not surprise you that the free version of Ninja Forms is installed on over 1,000,000 WordPress websites. What really sets Ninja Forms apart are the premium extensions that are available for the plugin. Extensions allow you to add conditional logic, multi-part forms, file uploading, front-end posting, and user analytics. Integration support for many popular online services can be added too. There is very little that Slider Revolution cannot do. It can be used to create regular slideshows, newsletter sign up pages, carousels, media galleries, and more. Everything is controlled from an advanced visual editor that lets you adjust each slide in any way you wish. By taking advantage of its layers system you can make professional slides in minutes.